NEW YORK, Feb. 1, 2019 /Christian Newswire/ -- An American missionary doctor who risked his life at the height of Liberia's 2014 Ebola crisis, and has spent more than 20 years doing medical missionary service in Africa, was honored for his many years of service there with SIM (www.simusa.org), an international Christian mission organization. 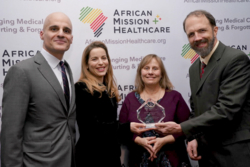 Photo: New York philanthropists Mark Gerson, and his wife Rabbi Erica Gerson, who established the annual AMH Gerson L'Chaim Prize for Outstanding Christian Medical Missionary Service, jointly presented the 2018 award to SIM Missionary Dr. Rick Sacra at a private dinner in New York City Jan. 31. Dr. Sacra received the honor for dedicating his life to medical missionary work in Africa. Mr. Gerson is also co-founder and chairman of Gerson Lehrman Group. SIM Missionary, 56-year-old-Dr. Rick Sacra, Massachusetts native, received the prestigious 2018 AMH Rabbi Erica and Mark Gerson L'Chaim ("To Life") Prize for Outstanding Christian Medical Missionary Service last night (Jan. 31, 2019). The annual award—the largest of its kind in the world—supporting clinical care in Africa—comes with a $500,000 gift. The prize is awarded by African Mission Healthcare (AMH), www.AfricanMissionHealthcare.org, a non-profit organization that strengthens mission hospitals to aid those in greatest need. AMH was co-founded in 2010 by entrepreneur, investor, and philanthropist, Mark Gerson and medical missionary, Dr. Jon Fielder, who is the organization's chief executive; the two became friends in college. Gerson, and his wife, Rabbi Erica Gerson, established, and began funding, the annual award in 2016. They jointly presented the 2018 prize to Dr. Sacra during the awards ceremony. "I was overwhelmed when I learned about the award and am extremely honored to receive it, which I accept on behalf of all those serving God with their medical skills," said Dr. Sacra who returned from Liberia for the awards ceremony. "I'm so grateful for the financial resources, and team of people God is putting in place to deploy them. This kind of support opens the door to accomplish things we've been dreaming about for years, which will benefit our patients and our community by improving the healthcare of thousands of Liberians." Dr. Sacra is the third recipient of the AMH Gerson L'Chaim Prize. Award benefactor Mark Gerson explained why Dr. Sacra received the 2018 AMH Gerson L'Chaim Prize. "L'Chaim means 'to life'—and it is the gift that the Christian medical missionaries serving in Africa provide to so many with remarkable effectiveness. Dr. Rick Sacra is a wonderful example of the love, compassion, and skills needed to provide this gift of life. When faced with adversity, including civil war, inadequate resources, and Ebola, he demonstrated heroism and commitment that we can only marvel at. When you add his passion and plans for training African health professionals, strengthening ELWA Hospital, and caring for the poor of Liberia, it's very clear why he was selected as our 2018 AMH Gerson L'Chaim Prize winner." Dr. Sacra will use the prize money to strengthen facilities at SIM's ELWA (Eternal Love Winning Africa) Hospital in Monrovia, the capital of Liberia; train Liberian Family Medicine residents; establish an intensive care unit with trained staff; and install solar power capacity. During his childhood, Dr. Sacra became inspired to pursue medical missionary work after hearing the story of the Good Samaritan. He is one of many doctors and other medical professionals serving with SIM in places of need around the world, using their skills to help share God's love through their care, presence and example. During his time in Liberia with SIM, Dr. Sacra has provided patient care training for medical workers and helped found ELWA's HIV/AIDS counseling and treatment program. In addition to the $500,000 L'Chaim Prize, Dr. Sacra is also one of the beneficiaries of a matching grant collaboration between AMH and Christian Broadcasting Network (CBN), which is providing a total of $2 million across eight mission teaching hospitals, including ELWA Hospital, in Africa to expand care, training and infrastructure. SIM (www.simusa.org) is an international Christian mission organization with more than 4,000 workers from 65 nations. SIM serves in education, community development, health care and Christian witness in more than 70 countries. Founded in 1893 as Sudan Interior Mission, SIM now serves on six continents, responding to need, proclaiming the gospel and equipping the Church. African Mission Healthcare (AMH) is a US 501©3 non-profit organization which strengthens mission hospitals to aid those in greatest need. AMH's approach is unique, investing time and resources to identify the investments that are really needed, carefully selecting the hospitals they work with, and truly partnering—not prescribing answers but together developing solutions. Since 2010, AMH has distributed nearly $20 million in assistance to 40 facilities in 16 countries. This support has made possible over 600,000 patient visits, 13,000 surgeries and corrective procedures, 115 healthcare scholarships, and training of more than 3,000 healthcare professionals. The Rabbi Erica and Mark Gerson L'Chaim ("To Life") Prize for Outstanding Christian Medical Missionary Service is the world's largest annual award dedicated to direct patient care. The product of the generosity of philanthropists Mark and Erica Gerson of New York City, the L'Chaim Prize is an annual $500,000 award selected by a panel of leaders in African medicine.